Diesel Fuel Additive - Optimize Injectors and combustion. Oil lasts longer. $$ Increase your income as an AMSOIL Dealer. Call us for the better prices but here is the online price and checkout with data. 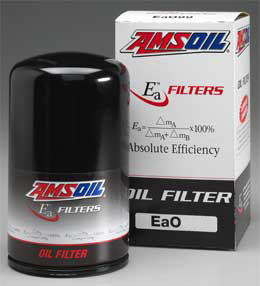 Amsoil EAO Oil filters (EAO-80 for your truck) are still the preimum offered on the market. These are the only oil filters available which offer the same Donaldson Nanofiber media (Endurance Series) offered only to class 6, 7, and 8 trucks. Of the 100's of innovative products we get a LOT of customers from all markets. 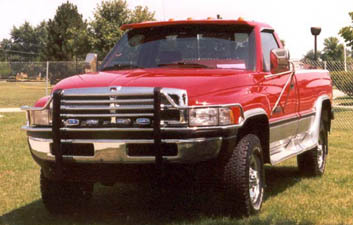 Our top customer base is you the Dodge Diesel Truck owner. We have catered our business around this fact and can offer you the best service and information. Please call me direct (800-579-0580) when you are ready to order or become a preferred customer. To outfit your truck with AMSOIL and our filters the PC (preferred customer account) will save you over $100. Call me and I will get your order done as a Preferred Customer. - We have the only 100% Synthetic Diesel Oil for newer units requiring CJ4. Our Amsoil CJ4 chemistry will not break down nearly as fast as the others due to a known fuel dilution issue with the DPF systems. AT 4% fuel dilution AMSOIL delivered while the competition failed! this brochure will cover the results: CJ4 Oils compared. Over the road trucks are experiencing 50,000 mile oil intervals with out loosing oil pressure under high heat. Use the AMSOIL DEO and DME Diesel Oil. (5W40 and 15W40). You may safely extend intervals up to 3 times longer with oil analysis. Save $ for Synthetic Diesel Oil! For those who want to save money and need to change at the OEM's longest interval try the new OE Series diesel oils. Available in both 15W40 and 10W30. The OED and OEC price is nearly 1/2 of the DEO. Call us for the Preferred Customer Price. Ship two cases and save even more - 800-579-0580. These are true CI4 (CI4+) diesel oils using the synthetic base stocks & additive packages for anti-wear (zddp) and our legendary high TBN long lasting detergents. Other brands are not stocking true CI4 diesel oils in most retail outlets now. That said, our DMO & DME CJ4 above are aggressive enough to be truely compatable in older engines too but most customers want to use the time honored and proven technologies before the EPA demanded the change. The AMSOIL AME remains the companies best seller today! View the 5W30 HDD as the same protection as the AME but even better quality and more efficiency for all climates in US and Canada! The #1 comment is regarding the improved mileage and smoother engine performance. AMSOIL is the only synthetic diesel oil designed for extended intervals which can resist the added sheer caused by new diesel emissions systems which increase soot, heat, foaming and rust. Another frequent comment is regarding reduced oil consumption to none at all. Feedback on 6.7 engines and prior 5.9 Cummins customers show that in 90% of all cases, AMSOIL has a definite noticeable impact on fuel economy. Find out why people have trusted AMSOIL for 35+ years. We feel the best contribution AMSOIL has to your diesel next to our engine oils is our improved fuel additives for ULSD Fuel. Product Code ADF (Diesel Fuel Additive) and ADF with Cold Flow. You need to return the lubricants and additives removed by ULSD. The new AMSOIL ADF improves mileage enough to pay for the product every time as verified and tested over 12.5 million miles. *Neutralizes acids in combustion from new fuel which shortens oil detergent life. Please review these additives and the Q&A section on the Diesel Fuel Additives. See price or save up to 27% buying a case as a preferred customer. In the Dodge 5.9 (up to 2007) when using AMSOIL AME 15W40, simply change oil and filter at 15,000 to 25,000 mile intervals. In newer units 2007 or newer Ram 6.7 use the DEO 5W40 for optimum performance and protection and to guard against issues with fuel dilution. You're covered by AMSOIL to go up to 3X longer if you use and follow the results of a Oil Analysis. That's also the best choice for all trucks using AMSOIL Bypass kits. In all Dodge diesels including those requiring CJ4 (DPF exhaust) and or CI4 units using the 5.9 or 6.7 who want a preimum synthetic but only want to change oil at the OEM interval or sooner, use AMSOIL OED 15W40. This was designed for the cost consious operator who is not interested in taking advantage of longer intervals. Costs 50% less than the above oils. The above picture shows the AMSOIL BMK-21 By-Pass oil Filter which is using a custom built bracket the battery sits on to mount the filter to the battery area. This bracket is of high quality. We also have a block mount version. Call us for more info 605-361-4075. 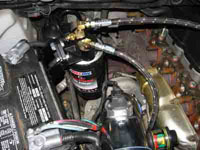 AMSOIL By-Pass oil filtration system. A soot removal device which will keep the engine at top efficiency long term and save hours on service. On the 5.9 if you use any sort of power enhancement chip you may be flooding your crankcase chamber with soot. In this case a Bypass helps with deposits and wear but one MUST use oil analysis to determine intervals. These power chips may significantly shorten the life of the engine if the oil is not monitored or filtered properly! BMK-21 mount kit; EAO-80 full flow filter; EaBP-100 bypass filter; BP-67 sampling valve; BK-1301 return cap w/ swivel adapter; BP-242 elbow and the BP-67 oil petcock valve for oil analysis (one free kit postcard now in all BMK kits!). Call me at 800-579-0580 for more info or to answer any questions on bypass kits. The new Absolute Efficiency Air Filters vary per year so please call so we can match your stock unit (most use the EAA-106 or 189 - not pictured below). These are washable, require no oils, meet OEM requirements and are guaranteed to last 100,000 miles or 4-years. More air flow than OEM and twice the filtration capacity. We also have cone replacement type in the same Nanofiber material for those with aftermarket intake systems designed for your 5.9 or 6.7 (Icebox units use our filter from the factory). 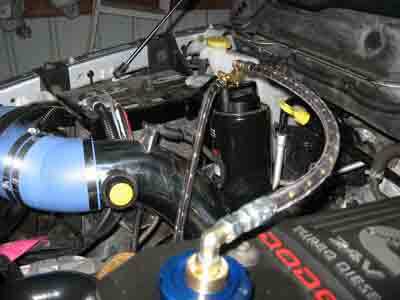 Use this link to go to the AMSOIL cold Air intake filters to match your unit. These offer many times the intake area. For 2002 and earlier we have a superior air filter option still available. The EaA-106 air filter is rated for 100,000 miles and should be cleaned at 25,000 by air. This new Absolute Efficiency air filter is guaranteed to filter 5 times the contaminants of cellulose types so should rarely restrict any air flow during it's life. Watch your gauge. These cost less to use than the OEM Dodge filter and have a OEM fit. And like all AMSOIL products, will not interfere with warranties. This is the same filter media used by the Abrams Tank. For 2003 and later we carry the WIX OEM type at a discount price. If you are considering the Bypass kits we suggest the Preferred Customer option. Call us for the part # you need, then as a preferred customer you will save on everything and receive the full ordering packet. Use our Online Application Guide to match your filters and to list all the choices you have for fluids in your truck. Increase economy even more using the new AMSOIL Severe Gear 75W90 or 75W140 which has a interval of 100,000 miles. I suggest taking a oil sample before you convert to AMSOIL just to see the current condition of the oil and wear patterns especially if you bought your truck used. Then once you have installed the AMSOIL AME 15W40 and EAO 80 Nanofiber Series filter, expect to run a minimum of 12,000 and up to 25,000 miles before changing oil and filters. If you have not seen the data on AMSOIL's superior synthetic diesel product, before you leave please visit our Synthetic Diesel Oil section but first check out the By-Pass filter section below. All the oils are best priced in our 4-gallon case or larger containers (5-gallon twin pack). The HDD 5W30 is the best choice if you are trying to increase fuel mileage in the 5.9 engine. Calls back to us reflect our customers can gain a 1 to 2-MPG increase over the life of the 5W30. The most common comment I get from my diesel customers (most use the lower price 15W40) is, "I expected a little increase in mileage but nothing like this! I can't believe it!" Change your Mind - NOT Your Oil! Switch to AMSOIL! Save time, fuel and cut your oil consumption significantly. This means your use of AMSOIL AME 15W40 in the Dodge Cummins (2007 and earlier) can be used up to 25,000 miles or one year. Knowing that Cummins designs these intervals to be conservative (using conventional SAE 40 motor oils), the use of an oil analysis will prove that the AMSOIL HDD (or AME) is still within the proper specs regarding to viscosity, alkalinity, wear metals, soot, NOX% (nitration and oxidation). For Mid 2007 and later using DPF systems please follow the interval suggestions for the AMSOIL DEO 5W40 or DME 15W40. For owners wanting to use a synthetic and change oil more often we do have a new lower cost oil called OED 15W40 for OEM Drains or shorter. For 2007 model years (Dodge 6.7) and newer requiring CJ-4 diesel spec, our DEO 5W40 is the best choice. The EPA required lower levels of detergent, AMSOIL's 5W40 CJ-4 contains a 100% Synthetic base oil which naturally works as a detergent. This gives us the advantage for longer engine cleanliness and trouble free operation. It's all in the quality control. AMSOIL is ISO 9001 Certified and a separate quality control team works within the plant with processes to ensure you get what was tested at the lab. AMSOIL is so proud of this new system they recently invited all competitors to see the new plant. AMSOIL works 10 years ahead! Under heavy loads or if your engine has higher than normal wear, just start your AMSOIL use by testing the oil with our ANALYSIS Kits. Test your old oil just before draining, then test the AMSOIL at your normal drain interval. Switching to our oils at 100,000 or more is not a problem what so ever. "I'm so tired of $70+ oil changes every 3 weeks and having to wait and watch over some one else change my oil! What is bulk oil anyway?" AMSOIL 15W40 is the solution to this problem! For your first order for your Cummins Turbodiesel ask for two EAO-80 filters, one 4-gallon or 5-gallon case of AMSOIL Diesel, a test kits (KIT-02) and two cans of our (FLSH-CN) engine flush when converting to synthetic for the first time. If using the engine flush, simply add the cans to the old, existing oil, idle for 15 minutes and drain before switching to AMSOIL Oil and Filters. Most AMSOIL diesel customers buy direct to get the best price and ordering simplicity. Call me at 1-800-579-0580 with questions or read about the Preferred Customer to buy at outright wholesale. 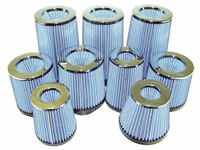 By-Pass Remote Filtration Units - Eliminate virtually all engine wear and oil changes. Cummings Diesel in pickups, etc. All Years up. * All kits now come with a free Oil Analysis! Use our By-Pass filtration kits and extend changes even further while virtually eliminating all engine wear thanks to the AMSOIL BE-Series filters. These filter to less than 1-Micron. Basically these kits filter 5 quarts in 5 minutes at 45 miles per hour and do not interfere with the flow demands of the engine. The BMK-21 simply attaches to the top of the oil filter casting (remove a plug) then you can choose to return the oil to the pan or oil fill cap. You may want to order the BP-89 swivel fitting for your oil cap if you don't want the return going to the pan. I strongly suggest the BP-67 (sampling valve) for this unit. Free Oil Analysis (one free kit). For the first go around change the full flow oil filter and bypass filter at 10,000 miles or 6-months for the first service, then every 25,000 miles for the full flow and 50,000 for the bypass or change the bypass filter every other full flow filter change. But you really need to use analysis if you don't drain the oil. It costs less than oil changes and gives you better piece of mind! Using analysis yearly you could reach around 350,000 or more before having to drain the oil while at the same time learn something about your engine as it ages. When using AMSOIL DEO, HDD or AME Diesel, your engine will run smother, quieter and many even notice a decrease in engine drag. Our gear and differential lubes will add to the economy. The entire state of North Carolina have completed studies proving the relevancy and value of these units in their busses. I get dozens of customers weekly who can't imagine going so long w/o draining oil but since the bypass kits became available in 1982 you should expect to be saying, "My average truck life has increased by several years!" Remember, the EaO-26 is 100% efficient at 15 microns for full flow and the EaBE-100 is 100% efficient at 2-microns and eliminates 39% of all soot. When you remove these filters and replace you are also adding enough oil to keep the detergency and wear protection above standard levels. Nitration and oxidation levels remain below excessive levels. If you want to avoid problems with soot and deposits, the By-Pass is your solution. Generally costs between $150 to $240 each depending on which engine you have and if you use the single, dual remote or Dual Guard. With the By-Pass system and AMSOIL diesel engine oils, you save time, money and your engine lasts longer. In Turbodiesel applications our Donaldson Full-Flow Filters are recommended for 25,000 without analysis. Change other manufactures' filters at the engine manufacturer's recommended filter change intervals. We also have commercial account pricing for use within your business. Contact us for price and we will also fax the application forms to get you started. I include the proper DATA SHEETS to every catalog request relating to your vehicle. Testimonial: Several of our customers using the diesel products for the first time always send feedback regarding their amazement on how well the oil actually performed. They can't believe how smooth the engine now runs and sometimes the mileage quoted sounds very exaggerated! One of my customers with the same impressions was featured on the 03 Calendar. Don't forget to examine the AMSOIL gear and transmission products to maximize your efficiency and totally extend all your fluid requirements while protecting your investment. People wouldn't use AMSOIL if we didn't offer something unique. For owners of the By-pass kit, you may drain a portion from the drain plug (difficult to get a representative sample) or if you have the By-Pass kit use the drain valve attached to the manifold for the quick and easy extraction. Order BK-13. Contact us for these kits. Non postage kits sell for around $17 and 2-way postage kits are $25.75. If you need to do several vehicles together. Co-op discounts available. The other day I was reviewing the April Action News and the new G-100 product catalog included in it. The products featured in this issue were our two new motorcycle oils. Anyone reading about these outstanding new oils could’t help be impressed by how they totally blew the competition away in head-to-head performance tests. Once again, AMSOIL outperforms the competition and puts test results that prove it right there for everyone to see. It’s also interesting that the very bike manufacturer that said not to use synthetic motor oils in their engines now sells and recommends a synthetic motor oil with their label on it. They don’t make it, but they profit from it so now it’s OK to use. That’s very similar to how the other oil companies and automakers badmouthed synthetic motor oils until they began marketing their own synthetic oils. Are their oils as good as AMSOIL? Not when you look at the tests! AMSOIL has a long history of making lubricants that are the very best. And the way we have shown they are the best is by testing them against the competition and publishing the results in our sales literature or right on the product labels. I don’t know of any other oil company that does this like we do. But then, I don’t know of any other oil company that makes products as good as we do, so they don’t really have as much to toot their horn about as we do.